The movement of waves in Saturn's rings offers clues to activity and conditions within the planet. This natural-color view of Saturn was taken from 764,000 miles (1.2 million kilometers) away. Unusual ripples in Saturn's rings are revealing the mysterious inner workings of the great gas giant. Planetary scientists and modelers are slowly picking apart that mystery. Billions of particles race around Saturn's 170,000-mile-wide (273,600 kilometers) set of rings, which are mostly water ice with a smattering of rock. 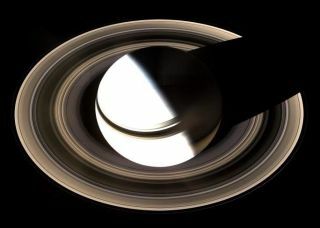 The rings are full of activity, including waves that ricochet outward in spiral patterns, most caused by the gravitational pull of Saturn's 62 moons. Waves caused by the moons, which orbit outside the rings' sphere, always travel outward. Most scientists' models of Saturn and other gas giants assume the planet is pretty uniform — just a large gas envelope surrounding a small, dense core that's perhaps the size of Earth. But by studying the rings' waves, researchers are finding the picture much more complicated. "The one thing that might produce this [series of waves] is that some sort of disturbance inside Saturn itself is spinning around with a period that's less than 7 hours," Phillip Nicholson, a planetary scientist at Cornell University in New York, told Space.com. Researchers first noticed hints of that disturbance in the 1990s, and Nicholson's team used more precise measurements to fully document the ring waves' structures, which reflect the oscillations of the planet within — sort of like recurring Saturn quakes. Right now, measuring those oscillations offers scientists the best possible chance to grasp what's going on far inside the planet, like Saturn's internal rotation or structure, which appears to be more complicated than previously thought, scientists say. "Even dropping a probe into the atmosphere would not necessarily help a lot, because the probe will only get down to a pressure of five or 10 atmospheres before it gets cooked or squashed," Nicholson said. "We need to go much deeper to understand this." Saturn isn't the only astronomical body with a groove; for many years, researchers have been watching the vibrations of the sun and other stars. Even Earth has a hum, and scientists use whole-Earth oscillations, triggered by large earthquakes, to discern what's going on inside. "The basic idea is that we know of many stars, including our own sun, that oscillate at certain frequencies that are determined by the actual internal structure of the planet or the star," Jim Fuller, a researcher at the California Institute of Technology, told Space.com. Fuller studies and models those oscillations, including those in Saturn, building off of initial work by Nicholson and his collaborator Matthew Hedman, now at the University of Idaho. Tools like NASA's orbiting Kepler Space Telescope, which precisely measures the brightness of distant stars while searching for planets orbiting around them, can send back information about changes in brightness detailed enough to see the stars' shifting— a field called astroseismology. Helioseismology, which measures sound waves below the sun's surface, has given researchers a detailed understanding of the flow of materials deep within the sun. Seismographs can measure whole-Earth vibrations directly, using the same process as ordinary seismology, which has told researchers about conditions deep inside Earth. But it is much more challenging to detect movements within planets humans aren't sitting on. Enter kronoseismology, the study of oscillations within Saturn. Nicholson and Hedman chose the name because Kronos (or Cronus) is the Greek equivalent of the Roman god Saturn, a mighty Titan, whose namesake planet has correspondingly mighty rings. Those rings act as a rare window into the movements at the heart of the planet. When Nicholson put together the series of waves caused by Saturn's movement for a 2013 paper, they didn't quite add up. Instead of a regular pattern of vibrations all building on one another, he was seeing multiples of some waves and missing others. Caption: Different oscillations of Saturn cause certain distinctive patterns in the planet's rings. By analyzing them, researchers are determining what's happening inside the gas giant. If the planet were very simple, it would have only one of each of these oscillation patterns, rotating at different speeds; instead, it has multiples of some and is missing others. "If Saturn were a nice big ball of liquid hydrogen and helium, liquid and gas, it really should only have one frequency associated with each of these overtones," he said. Instead, the measurements were like a violin that plays multiple discordant tones when one string is strummed. There's "something a bit wrong with your violin, if that's the case," he said. Fuller has conducted follow-up research to try to find the possible causes of the discord. "Saturn must have a layer deep down inside of it that's stably stratified," he said. "For some reason, the fluid is very stable and doesn't move around very much ... And that part is new, because the conventional models of giant planets are just convective envelopes [where the materials move freely to exchange heat] all the way down to their core. But what I found is that those very simple models can't explain what we're seeing in the rings." Fuller suggested that the stable layers could have a number of causes. By modeling each potential scenario and measuring the waves it would create, he and others are hoping to narrow down the possibilities. One explanation, he said, is that the helium is separating from its mix with hydrogen lower down in the planet, because of higher pressure, and condensing into helium raindrops that fall even deeper. Then, the boundary between the high-helium area below and the mostly hydrogen area above would be a stable border, Fuller said. Another explanation might be that the ice and rock of the core are dissolving upward into the hydrogen and helium that make up most of the planet. That, too, would create smooth layers of fluid beneath the turbulent gas above. "In the past, people have thought of these ideas, but it's been very hard to test them because we have no way of seeing what's inside of Saturn," Fuller said. "But with the seismology, for the first time, we're starting to get a glimpse of that interior structure. It's still pretty primitive, because we can only detect some of Saturn's operations, but it's enough to give us some interesting prospects, at the very least. New models of a gas giant's interior will help reveal which of these possibilities, or others, could match Saturn's real oscillations. "We're mainly waiting for theoretical developments," Nicholson said. In the meantime, the Cassini orbiter is continuing to grab detailed data that will lend greater focus to the findings. When it spirals into even lower orbits, it might be able to reveal more about subtle changes in the planet's gravity as well. Researchers are also looking at Uranus' rings to see if they can discern anything about the inside of that planet — and there are many other rings to consider out in the solar system. But for now, Saturn offers the best glimpse into the depths of a gas giant, which can be compared and contrasted with the distant planets seen around other stars. Exoplanet researchers like Jonathan Fortney at University of California, Santa Cruz, are eager for anything that will pierce the veil of the gas giants. In fact, he said, one of his graduate students is waiting until Cassini plunges into Saturn, in 2017, to combine the new gravitational data with kronoseismology to get an even more detailed picture. "There's a paradigm of giant planets being pretty simple objects, where they have a core of ice and rock, and this tremendous envelope of hydrogen/helium on top of that," Fortney told Space.com. "That's how people have mostly modeled giant planets for 50 years. But what the kronoseismology tells us is, there's some region that is strange, there's some part of the bottom of the envelope that's not simple, that's not convective. It tells us that Saturn is not a simple object; there's something more going on there."